Technological advances push holograms forward for packaging applications, says Manoj Kochar, chair of the International Hologram Manufacturers Association, who looks at the latest eye-catching – and award-winning – developments. End-user demand and the search for ever more interesting packaging concepts and design show holography continues to prove itself to be an extremely versatile and flexible technology. It lends itself to integration with various substrates and print and conversion technologies, thus creating new products and applications. There is now a new generation of optical structures in development with distinct visual effects that will make it easy to identify, and even more difficult to simulate, while new techniques in film coating and manufacturing technology are seeing the boundaries for the use of holographic materials being pushed further and further: a wide variety of specialist origination techniques offer an almost infinite variety of colourful 3D visual effects, ranging from the bright and stunning, to subtle graphic features and tones. The brightness, vivacity and luster of the hologram makes it a highly eye-catching packaging accoutrement. Various surveys have established that the technology grabs the attention of the consumer browsing along shelves in a store or supermarket. There is one single property that all brand owners look for in their packaging—maximum brand appeal. Holograms also impart a premium look to the package, and hence more and more companies are using holographic films and foils in their packaging. 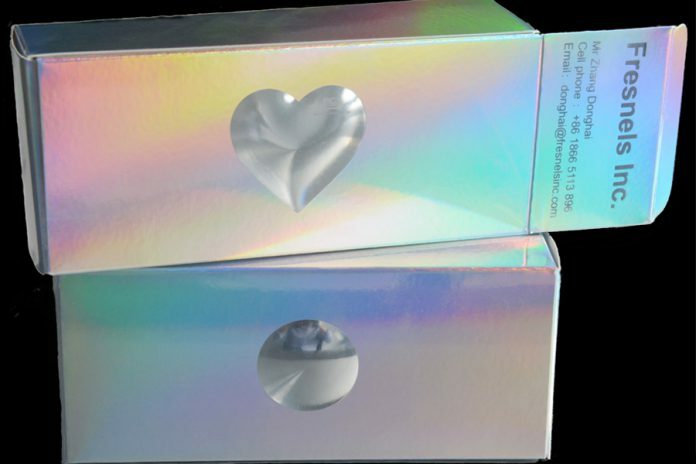 Toothpastes, premium cosmetics and personal care products are among the big users of holographic elements in their packaging. In this application, the security that is naturally provided by a hologram is of peripheral benefit as any custom-designed holographic pattern offers the option of including security features to make the package secure against counterfeiting. Innovations in holographic films are ideal for a wide variety of flexible eye-catching applications, further increasing the creative visual opportunities for packaging and print designers to reinforce brand identities, catch the customer’s eye and reinvigorate mature or aging designs. Holography’s constant capacity to refresh and reinvigorate brands continues, highlighted by the recent holography industry awards—Excellence in Holography Awards 2017—where imaginative solutions reinforcing the important role the technology plays, particularly in tackling product anti-counterfeiting and authentication, were to the fore. An eye-catching design for an annual calendar and supporting materials won the Best Applied Decorative/Packaging Product. The Hazen 2017 calendar, supporting a six-panel brochure and folder, features rich, graceful and elegant printed patterns along with pearlescent and metallic coatings that glisten on the paper surface. The proprietary imaging processes used by Hazen produce papers that can be optimized and customized by in-house designers to produce three-dimensional and truly holographic shapes and complex artistic designs. And, of course, where holography delivers eye-catching design to packaging, it also adds value as a highly effective and tamper-resistant security feature. For example, the advanced optical security element DID Graphic Wave from Surys, which is easy to identify with the naked eye, has been showcased for its role as a next generation visual security design, visually disruptive from traditional holograms. The technology reproduces a design with two diffractive colors, visible at a direct reflection angle. When the image is 90° rotated on a horizontal plane, there is a tint permutation between two colors: its recognition is extremely easy and very ergonomic. Magnum from Holostik is a secure yet eye-catching hologram that incorporates a portfolio optical of features, including full visible dynamic effects, emboss effects producing depth, kinetic effect, Fresnel effects, 2D/3D effects, 3D text, gradient effect, animated flower and text, and an animated covert laser readable effect together with many other features. New imaging techniques and combinations of other overt authentication technologies with holograms are producing advanced optical security devices which combine ease of recognition benefits with significantly enhanced resistance to counterfeits, enabling products to be controlled through an expanded system solution involving security authentication features, tracking mechanisms and investigative services. So, it remains appropriate that as the hologram marks more than 70 years since its invention, the technology remains as pertinent as ever, continuing to go from strength-to-strength as an effective packaging device, demonstrating the highest standards of visual appeal, quality, creativity and technical ambition. And, with the seemingly remorseless march of technology, there’s no reason why it will not continue to evolve as packaging designers and developers continue to see the benefits unfold before their eyes and remain comfortable with a technology that has a lot to offer.